Hate-group trackers say the broader trend is more overall tolerance disrupted by periodic bursts of violence from a disenfranchised fringe. The contrast between the Anti-Defamation League’s 2013 audit and the Sunday attack that killed three people highlights what hate-group trackers say is a broader trend: more overall tolerance disrupted by periodic bursts of violence from a disenfranchised fringe. Cross remained jailed Tuesday. It was unclear when formal charges would be filed against Cross, who shouted “Heil Hitler” at television cameras as he was arrested. Officials said Monday that a federal grand jury is expected to consider what investigators are calling a hate crime. In a report April 1, the Anti-Defamation League noted a 19 percent drop in anti-Semitic incidents last year compared to 2012, part of what the group called a “decade-long downward slide” and one of its lowest tallies since it started keeping such records in 1979. But he acknowledged that by Monday, as the first night of the Jewish festival of Passover approached and the Kansas City area remained stunned by the shootings, the report’s positive findings seemed tragically obsolete. “So the statistics are good, and then you wake up in the morning and three people are dead because someone believed them to be Jews,” Foxman said. None of Sunday’s victims was Jewish. Dr. William Lewis Corporon, 69, and his grandson Reat Griffin Underwood, 14, were at the community center for a singing contest audition, while 53-year-old Terri LaManno was visiting her mother at the retirement complex. 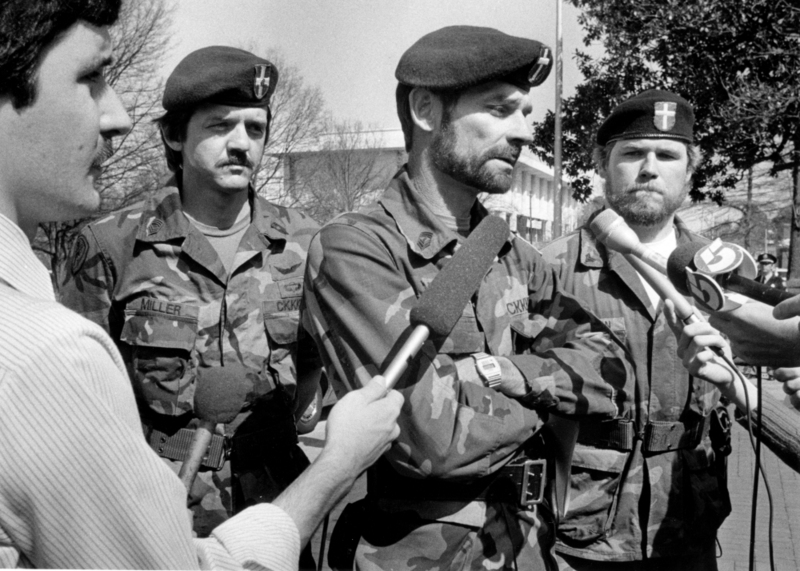 After a 1986 contempt-of-court conviction in North Carolina for operating a paramilitary camp, Cross went into hiding while free on bond and fled to Missouri. There, federal agents found him and several other men in a rural mobile home stocked with hand grenades, automatic weapons and thousands of bullets. His move to southern Missouri placed him in terrain familiar to those who monitor hate groups. The Ozarks region has long been home to supremacist figureheads and their followers, and Cross’ profile prompted the Institute for Research & Education on Human Rights to highlight him during a presentation for FBI and other law enforcement officials earlier this year, said Devin Burghart, the group’s vice president. Cross’ cooperation with law enforcement has left him on the margins within a movement he’s been part of for decades, Burghart said. Burghart said his group made a presentation on white supremacists to the Jewish Community Center in August, a discussion that included a description of Cross as an example of dangerous anti-Semitic figures in the region. It wasn’t clear what, if any, steps were taken by the center to act on the information. Before the shootings, Cross had been contemptuous of some of his like-minded allies’ reliance on social media over violent confrontation, Burghart said. “He felt it was easy to be a ‘keyboard commando,’ but that the only way activists will ever succeed is by going out on the streets,” Burghart said. Attempts by The Associated Press to reach Cross’ family were unsuccessful Monday. Knocks went unanswered at his small, single-story home bordered on three sides with barbed-wire fences near the southwest Missouri town of Aurora, about 180 miles south of Overland Park. Parked outside was a red Chevrolet bearing two Confederate flag stickers.